Take care of your sensitive skin with the NIP+FAB Glycolic Fix Gentle Pads. An extra-gentle version of the brand’s bestselling exfoliating pads, the treatment is enriched with calming ingredients such as Panthenol and Aloe Vera to restore moisture and soothe dry, irritated complexions. Key ingredient Glycolic Acid works alongside Fruit and Hyaluronic Acids to gently cleanse pores, moisturise and nourish skin to reveal a natural-looking radiance. 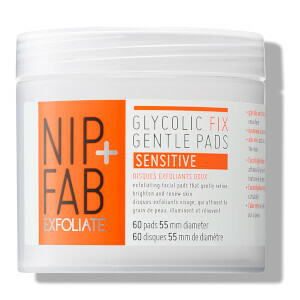 Wipe a pad across face, neck and décolleté. Apply to cleansed skin once or twice daily. For sensitive skin, apply twice a week and increase use overtime. Aqua (Water), Glycerin, Polysorbate 20, Vaccinium Myrtillus (Bilberry) Fruit Extract, Glycolic Acid, Phenoxyethanol, Saccharum Officinarum (Sugar Cane) Extract, Sodium Hydroxide, Benzyl Alcohol, Citrus Aurantium Dulcis (Orange) Fruit Extract, Citrus Limon (Lemon) Fruit Extract, Aloe Barbadensis Leaf Juice Powder, Disodium EDTA, Panthenol, Parfum (Fragrance), Limonene, Acer Saccharum (Sugar Maple) Extract, Dehydroacetic Acid, Sodium Hyaluronate, Linalool, Geraniol, Citral.